Happy Monday and how was your weekend? We had a fun one, walked along the beach, reunion dinner with lots of food and were out and about a lot. I love using one of our cutters from the lunch punch set during busy mornings especially Mondays. Today, I decided to use the cupcake cutter from the Sweet set and I am sure that this lunch will make Nikolai's day more cheerful. Cup cake shaped sandwich from lunch punches sweet set with a heart shaped cut out. Seedless red grapes and heart shaped strawberry cut into half. Organic baby carrors and granola bar. 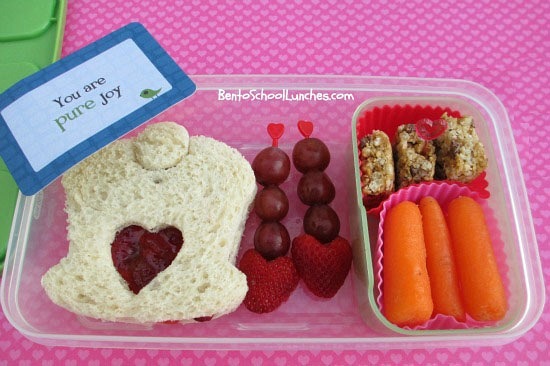 Included a lunch box love note and packed in a Rubbermaid lunch blox.